Elevate semi-trailers to loading docks for maximum serviceability during loading and unloading operations. 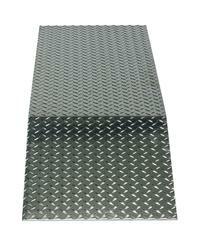 Manufactured from heavy-duty aluminum treadplate for positive traction. Welded all aluminum construction. 30,000 lbs. capacity per pair. Wheel Risers are designed to facilitate compliance with OSHA requirements for a 10% maximum grade of ascending or descending loaded fork trucks. Priced Each. Note: Dual wheels on Semi-Trailers are 18"W. The 24" wheel risers work best for this application. Model V-R-CAD (Pic. 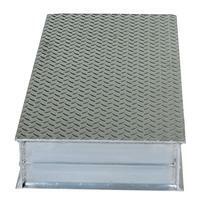 3) - Portable Wheel Riser Caddy - move steel or aluminum wheel risers out of the way with this easy to use mover. Snap roller into riser and way you go. Requires V-R-CAD-KIT for each riser.